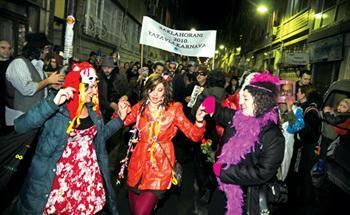 One of the oldest settlements in Istanbul, the neighborhood of Kurtuluş, will host the colorful Tatavla Carnival on its streets again this year. This year, like last year, Greeks originally from Şişli’s neighborhood of Kurtuluş (which is known as Tatavla in Greek) will descend upon Istanbul from Greece for the carnival, which is held just before Christians enter the 40-day Lenten period before Easter, despite the major economic crisis there. On Feb. 27 at 7 p.m., a cortege featuring revelers decked in colorful carnival costumes will start from Emekliler Evi (Retirees’ House) in the neighborhood of Feriköy and pass down the Baruthane and Bozkurt streets, ending at Son Durak (last stop) in Kurtuluş. The entertainment will then continue at the local Tatavla Restaurant, Hüseyin Irmak, a researcher and writer who has been responsible for the revival of the event for the past three years, recently told the Hürriyet Daily News.